Figuring out what to wear in Aqaba is not all that complex: the usual conventions on apparel and modesty in the rest of the kingdom’s more developed cities (think Amman) are applicable here as well. The city is not entirely traditional, given its heavy exposure to foreigners and tourists-this was the kingdom’s trading port to the sea for centuries, after all-but you do still have to be mindful of some notes regarding your presentation. 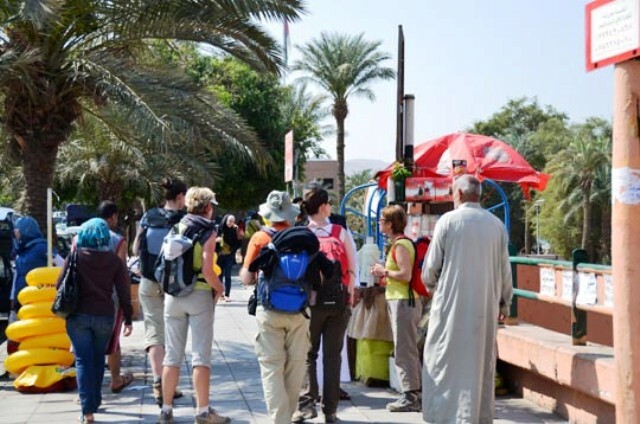 Aqaba’s people are pretty used to seeing people walk about in Western dress, so you can wear your usual t-shirts and trousers around the city if you want to. Women are not obliged to cover their heads-but might find themselves doing it anyway after a day’s exposure to the sweltering sun. Much like the rest of Jordan, Aqaba is desert-hot. It is so hot, in fact, that you may well have to restrict yourself to breathable fabrics and lightweight summer clothes for the duration of your stay, whether you go in their hot season (April to October) or their so-called cold season (November to March). The difference in temperatures is not that great: the former gets temperatures around the 90’s and above while the latter gets temperatures around the 80’s on the Fahrenheit scale. Covering up is better than trying to tan here. For one thing, the locals are more likely to think better of you if you do not wear things that expose too much leg or your shoulders (this goes for both men and women). For another, the desert sun here is not softened by clouds. Rains are not common here either. Aqaba gets so little rainfall that there are months where it rains only on one day and the total precipitate can go below a millimetre in the monthly measurement. Even on the rainiest months, the most precipitation that is usually recorded is 8mm. Now if you are thinking of going to the beaches, keep in mind that you should still try to go for modesty instead of getting too comfy with revealing your body. To be fair, people here are on the whole quite welcoming and tolerant. Even a woman wearing a bikini on the public beach should still be relatively safe. But shall she be well-received? There is the issue. In other words, if you are going to be going to one of the beaches on the coast, aim for more clothing instead of less. Wear a swimsuit if you want but wear a shirt and beach shorts over it for safety, so that you do not end up attracting unwanted attention or disparaging glances. The locals like it when tourists observe their customs and traditions, and it is only fair that you try to do as they do here. Do you need to wear their costumes? Not at all. But you do need to respect the ideas behind their apparel. This is the general rule to follow when trying to determine what to wear in Aqaba, on the whole.